Carol and Daryl pursue the car with the white cross on it into the city. The two attempt to relocate it but are interrupted by Noah. He takes their weapons. The two continue on their way, discussing about the people they were and are. 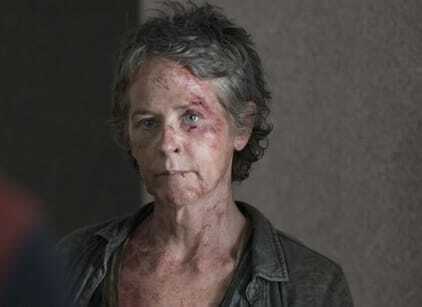 Carol talks about being in an abusive relationship and how she’s been affected by all the killing and hard decisions she’s made. Daryl continues to talk about changing and getting a fresh start. Along the way, the two are forced into a van to avoid walkers. They crash off the bridge, mildly hurt, and continue on towards the hospital. They run into Noah again and manage to get their weapons back. Daryl is ready to leave him for walker food, but he and Carol then decide to help him. Noah reveals he knows Beth and that the hospital people will be coming for him. As they attempt to leave, Carol is hit by a car with hospital cops inside. Noah restrains Daryl from helping, telling him she will be helped at the hospital. He and Noah head back to the church for reinforcements.